There are more than a hundred definitions of high-ability. No single definition of high-ability is accepted by everyone or even by a majority of people. There are several general ways of defining high-ability. The first is based on schools’ definitions of high-ability, mostly based on the policy of the government’s Department of Education in that country. Those school-based definitions are relative; at one school a child can be seen as high-able in school and at another, the child is not considered high-able, it can even differ from year to year. It differs between schools, countries and continents. 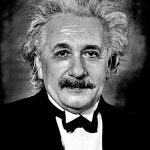 The research-based definitions of high-ability are the result of research done into the field of high-ability, influenced by the perspectives of the different researchers. Those definitions are mostly connected with a theory that can be used to enhance or research the situation of high-able pupils and can be applied in research, testing, the classroom, intellectual peer groups or counselling situations. In general teachers and parents confirm that behaviour and constitution of the high-able differ from their peers. Parts of Clinical Observed Based Definitions are found most practical and often used in supporting high-able children, teenagers and young adults within the PowerWood Community. The notion of Silverman (2005) of high-ability as an asynchronous development is very helpful in understanding and coaching high-able children and teenagers, and this has been defined by the Columbus Group. Also very helpful and practical have been the theory and in particular several concepts that are part of Kazimierz Dabrowski’s Theory of Positive Disintegration, which describes how a person’s development grows as a result of accumulated experiences. 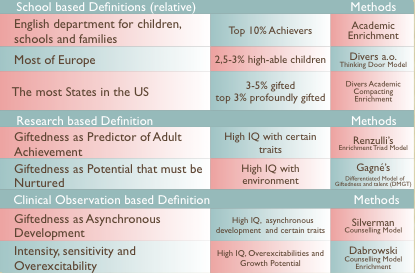 The schools’ definition of high-ability can differ significantly from the professional definition of high-ability and the parents’ definition of high-ability. These differences in definition can be a cause for concern and confusion for schools, teachers, professionals, parents and pupils, making communication difficult. In discussing high-ability it is therefore important to be clear about which definition of high-ability is being talked about, or come to an agreement. A solution-focused eclectic approach towards high-ability has been, until now, most effective. All developed definitions and their theories deal with other aspects or sides of high-ability and often contribute positively with practical ideas towards meeting the intellectual, social and emotional needs of the high-able.